Last week I wrote about Tracey and Weirsma’s great book “The Wisdom of Market Leaders”. Over the next few blog articles I want to dive in a bit deeper and analyze each of those types from a sales perspective. This is, afterall, a sales blog! You sell the total solution. You appeal to customers who realize that getting the best product or the best price is not nearly as good as getting the best total experience. These are customers who think “total cost of ownership, not cost of product”. You know that simply acquiring a product at a good price doesn’t mean much if the customer lacks the skill to achieve optimal results. You know that the keys to your success are your ability to craft custom solutions that are perfectly fitted for that customer. You realize that a sale is not good enough, rather, you are after long term highly profitable relationships. As part of your operating model you strongly believe that losing money is not nearly as bad as losing a good customer. You are ruthless at qualifying. You want fewer customers with deeper relationships, rather than lots of them with shallow relationships. Your sales people will tell the prospect in no uncertain terms the type of customers they seek – those that see them as problem solvers who add value to their business, not product pushers or low-cost providers. You hire people with deep knowledge of a certain industry, who excel at understanding the customer’s underlying problem, people steeped in building customer relationships and people who can and will customize solutions to meet the specific needs of their customer. Your sales people excel at having business discussions with business people; not endless discussions and debates on product features and functions with technical people. You focus on the lifetime value of the customer and long term customer satisfaction, not what this year’s revenue will be, and you pay accordingly. You probably have both hunters and farmers.The hunter is good at finding the customer, selling the vision, having detailed knowledge of the customer’s business and industry, and being able to configure the solution to that customer. The farmer is expert at customer relations, at listening and responding to customer needs, to having detailed conversations on the customer’s future needs (in business terms, not in product terms) and at conveying the continued value to the customer is the customized relationship between them and the vendor. Your people routinely have quarterly business reviews with their clients, not to talk about how the product installation and training is going, but what impact the solution is having on the business. Your sales team will never perceived as a people trying to sell to the customer, rather they will foster the kind of relationship where customers will want to buy from them because they know they will get the best solution for their business — and they are willing to pay for it. 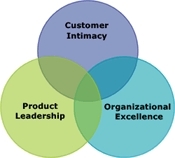 If you’d like to discuss how you and your company can be one that focuses on customer intimacy give me a call.